Beyond-Bedding: Ease Bedtime Angst With These Helpul Tips! Ease Bedtime Angst With These Helpul Tips! Almost That Time of Year! Keeping your child's sleep routine consistent is the key factor in avoiding bedtime conflicts. Putting your child to bed at the same time every night will be beneficial to both you and your child. ParentsConnect.com is a great source for parenting advice. You will find tons of useful articles and resources to help ease the angst of parenting. I found this list of ‘Kid Sleeping Tips’ to be quite interesting. 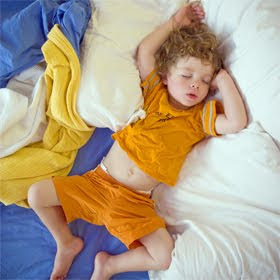 Read these easy sleep tips and your little one will on their way to dreamland before you know it! “We know you've heard that a warm glass of milk packs a sleep-inducing punch, but did you know that bananas, turkey, peanuts and yogurt are also loaded with sleep-triggering tryptophan? Serve up a small tryptophan-rich snack about 30 minutes before bed and your kid will be sleepy and full at bedtime. Help your kid relax by adding some calming lavender-scented soap and can be shared with his tired, stressed parents, too. Add a relaxing foot massage to your kid's bedtime routine, or a back scratch, arm tickle, head rub. Warm, cozy feet are a natural human sedative, so layer on the fuzzy socks, bunny slippers footed blanket sleepers and make sure they have comfy bedding! Do some gentle stretching with your kid (be sure not to get her wound up and crazy) right before bedtime. A few gentle stretches and poses may help your kid unwind and relax her tired muscles. Soothing instrumental music like opera, jazz, classical and New Age is known for its soothing and calming qualities. Just be sure to skip the big climactic numbers with their big cymbal crashes! Instead of reading your kids a story, tell them a story once they are in bed with the lights off. Have them lounge back, close their eyes and relax as they listen, they just might fall asleep before you finish. Get a night-light. We know, it seems kind of counter intuitive to light up a room to help your kid sleep, but a dim light can do wonders at keeping the "monsters" at bay and keeping the calls for Mommy to a minimum.